Kenworth was founded in Portland, Oregon in 1912 by brothers George T. and Louis Gerlinger, Jr. as a car and truck dealership known as Gerlinger Motor Car Works. In 1914, they decided to build their own truck with a more powerful inline six-cylinder engine, the first put into a commercial truck. The Gersix, as it was known when introduced in 1915, was framed in structural steel, which along with its power, made the truck ideal for logging in the rugged Northwest. In 1916 the company moved to Tacoma, Washington, where Seattle businessman Edgar K. Worthington was managing his mother's commercial building. He became intrigued by the Gerlinger company, which was doing quite well, or so it seemed, as the Gersix became a popular fixture in the Northwest. In 1917 Worthington and his business partner Captain Frederick Kent bought the business, renaming it the Gersix Motor Co.
Kenworth trucks are used in transportation of cargo in our dispatching company . In 1919 Kent retired from the business, and his son Harry Kent became Worthington's new partner.In 1922, Gersix made 53 trucks at its factory on Fairview Avenue at Valley Street. Under the new name, the company moved to 506 Mercer Street and later to 1263 Mercer Street. Trucks and motor coaches were assembled in individual bays rather than on a conventional assembly line. In 1923 Kent and Worthington reincorporated the business as the Kenworth Motor Truck Company, a combination of the names "Ken" and "Worth". In 1926 they started making buses, and in 1933 Kenworth was the first American company to offer diesel engines as standard in their trucks. In 1945 Kenworth was bought by The Pacific Car and Foundry Company. As of August 2016, North American Kenworth models include the T680 (60% of new sales), T880 (near 30%), T660, T800B and W900 (sharing the remaining ~10%). - ICON900, a limited-edition premium version, introduced in 2015. 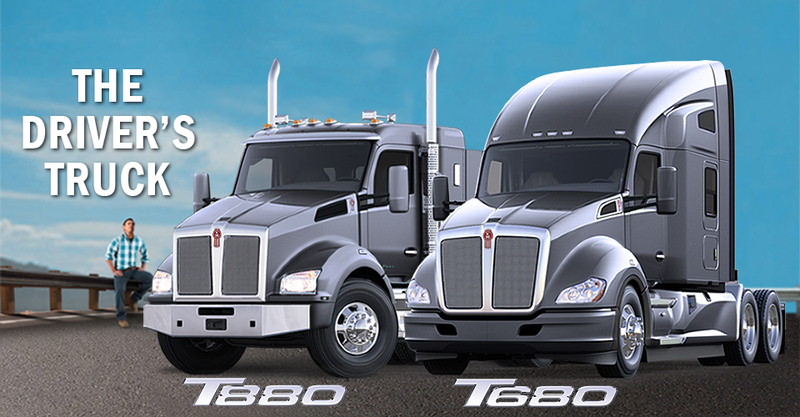 - T800W, which bears a wider grille, to accommodate a bigger radiator, for severe on highway applications. Our company offer professional dispatch services for owner operators and truckers. The Model K and Model W buses looked quite similar, but all similarities ended there. The differences were their length, side window design, and the choices of available engines. The model W had a pancake underfloor Hall-Scott 190 engine, while the K was powered by an International Red Diamond RD450 in the rear of the bus. The shorter model K was capable of hauling 25-33 passengers, while its bigger brethren could haul anywhere between 31 and 41 passengers depending on configuration. The Model N, as announced, would have seated 36 to 44 passengers in an underfloor engine configuration, but in 1947 it was downsized to a 32 to 36 passenger bus when the original design found no takers. After 1947, Kenworth began assigning numerals to the model designations to signify evolutionary variants in the design. As production orders for the interurban model Ks and model Ws waned, Kenworth focused its attention on special orders including an order of 10 "Brucks" for Great Northern Railway in Montana, (an earlier version was built for Northern Pacific Transport, but was a split-level coach) and several Highway Post Office coaches. These "special order coaches" were based on the model T school bus, which entered production in early 1949, after additionally test-marketing a small 20-passenger bus known as the Carcoach (only one was built, but none entered full production). The Model T school bus, which entered production after the last bus was built for Great Northern in April 1949, was an immediate hit with many school bus operators in the Pacific Northwest. The T-126 as it was known, boasted a unique four-pane windshield that offered unheralded forward visibility in any school bus at the time, and was the first school bus ever built to feature a roof escape hatch (now required equipment). Production of the T-126 averaged over 375 buses per year, making it Kenworth's most lucrative bus offering in the company's history up to that time. Shortly after its launch, Kenworth renamed the line the model CT. The model CT also came in several varying passenger capacities ranging from 55, 61, 67, 73, and 79 passengers. The model CT "Pacific School Coach" was powered by an International Red Diamond 450 inline six-cylinder gas engine placed at the rear of the bus, and a LeRoi H540 engine was made available for an LR-73 model that was produced in August 1950. Some orders for modified model CTs were made available and sold internationally, with variants being sold to Uruguay and Venezuela, as well as the Middle East. After the boon of school bus production, and to focus more on truck production due to a rising number of heavy duty truck orders, all bus production was shifted from Kenworth over to Pacific Car and Foundry in the middle of 1956. After some final cleanup, PC&F wound up completely outstanding orders for the Pacific School Coach in early 1957. Shortly afterwards, PC&F sold all rights, tooling, and equipment to Gillig Bros., a school bus manufacturer based in Hayward, California. Gillig would later incorporate many designs of the model CT "Pacific School Coach" into their own Transit Coach line of school buses, starting with the 501- and C-series models in 1958 and 1959, respectively.